So the only options are being resigned to the inevitable, putting pressure on the wounds and cleaning up the gore? "We can't stop every terror attack," International Risk Mitigator Lloyd Figgins admits to The Telegraph readers. 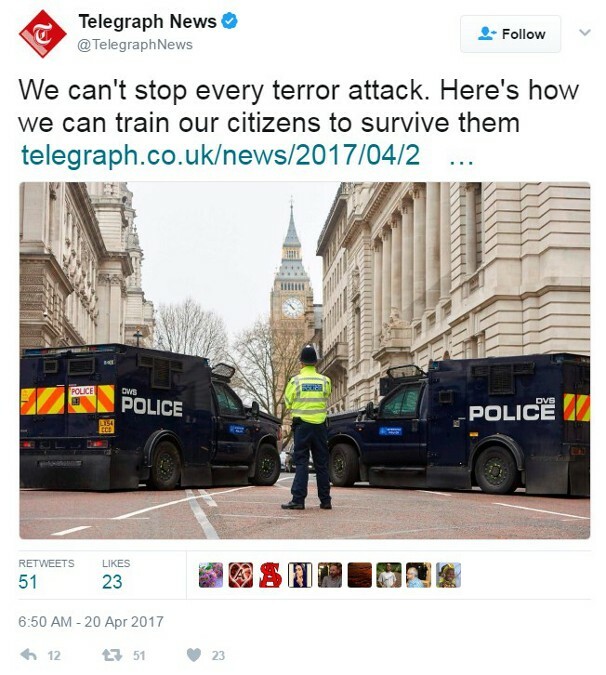 "Here's how we can train our citizens to survive them." He's "a former police officer, soldier and expedition leader," his Amazon profile tells us. Aside from being the author of a book that tells how he's almost been a violence victim on several occasions, he presents himself as an expert on "choosing the right seat on an aircraft [and] surviving a terrorist attack." He's also CEO of LFL Global Risk Mitigation, which operates all over the world, ostensibly helping clients make the losses, pain and costs of hostile actions less severe (if we're to correctly understand what the term "mitigate" appears to promise). So how will he mitigate risks for citizens caught up in a terror attack? He starts with situational awareness, which is pretty much common sense. Our own Jeff Cooper came up with a "Color Code" that encompassed the elevated stages, but importantly, he included an active response component enabling individuals to, you know, stop the threat. Figgins does not go that far, probably because subject disarmament edicts make a self-defense response ... problematic. "With Islamic State strongholds in places like Mosul beginning to fall, more and more jihadi fighters will return to Britain," Figgins notes. What he doesn't address is why an "imported" population with a belief system inimical to Western values has been inflicted on the native population in the first place, nor does that acknowledge the inevitable radicalism such enclaves breed and incubate. Basically, it sounds like his plan is to make the public aware of telltale signs to watch for (without committing the unforgiveable xenophobic sin of stereotyping or profiling), and then to alert the authorities. We have that here, too with DHS urging us "If you see something, say something" (which might be an option if people who did weren't then ridiculed by Democrats for being bigots). OK though - we get "be aware," and if something seems amiss, call the cops. But what if action is going down right now, and it's too late for that? First, those thinking of perpetrating an atrocity are warned there's no place they can hide without being caught. That's an almost laughable assumption considering those radicalized enclaves.